That means you get FOUR courses to expand your creative freedom! 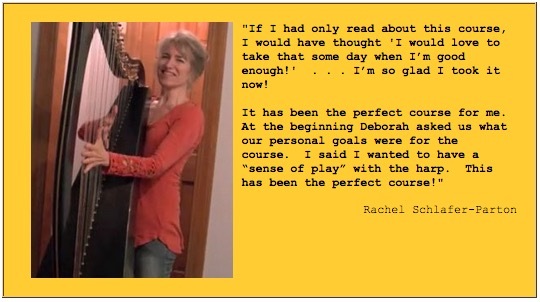 Already have a full-level Hip Harp Academy Annual Membership? Then you’re already in “Summer Harp Jam!” Log-In Here and look for the “Summer Harp Jam” Badge. If you’re not a full-member of the Academy …READ ON! Unleash the JOY of being able to just sit down and PLAY! How can some musicians just sit down and ‘jam,’ making up melodies seemingly ‘out of thin air’?? or do they have skills that anyone could learn? 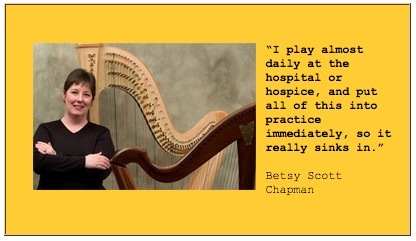 Watch this video from the inaugural year of “Summer Harp Jam” to hear what my inspiration for creating the program was. Now in 2018 there’s more you can learn, more musical games you can play with – and still the same kick-back-and-just-PLAY as when I first created the program. 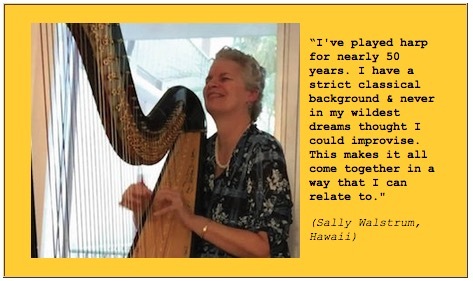 It’s a Virtual Summer Camp for Harp Players! The Fun begins NOW and lasts all Summer! I thought the ability to improvise was something I was born with — but that’s because I forgot how I’d learned it! I forgot because it was so fun to learn, that I thought I was just playing games as a child. Now I know that those ‘games’ I played with my mother were teaching me musical skills I’d use my whole life. And this summer I want to teach them to you! “Summer Harp Jam” is a 6-Week virtual summer camp with Deborah Henson-Conant that’s exclusively for harp players – lever or pedal, from fledgling to professional – and gives you a treasure chest of jams, vamps and play-alongs that strengthen your improvisation and rhythm skills while you’re having FUN! A JAM is basically any simple musical structure that gives you a foundation for improvising without extensive preparation or predefined arrangements. The jam sequences we’ll learn can be as simple as two chords and a rhythm that you can use as a solo player — or as involved as a song that you lead with sections where everyone gets to play. Don’t think you have any improvisation and rhythm skills? You WILL after Summer Harp Jam!! In “Summer Harp Jam” there’s a huge focus on PLAYING, and a minimum of “training videos.” Instead of me telling you how to do something, I’ll be showing you – mostly in playalong videos — and you’ll be playing it right back to me. Then you’ll get to take those ideas and play with them even more, because each week you’ll also get play-along files and cheat-sheets. And of course that live session is videotaped so you can watch it and play-along over and over. So you can play Play PLAY as much as you want!! Another reason I call it a Virtual Summer Camp is because there’s NO HOMEWORK! Woohoo! And you’re playing ALONG almost all the time with other people – or with yourself! You’ll get lots and lots and LOTS of focused play-time and there’s no way to get ‘behind’ – because everything’s videotaped, you can download all the audio-playback files and the PDF cheat-sheets and you’ll have at least 6 months after the course ends to access all the course videos and download the playback files and cheat-sheets to take with you on your iPod or MP3 player. You’ll find you can sit down for five minutes … and just keep playing and playing and playing. SUMMER HARP JAM is part of this summer’s “Jazz for Harps” program. So when you sign up for “Summer Harp Jam” this year, you get FOUR great classes to expand your creative freedom! HANDS ON HARMONY gives you the fundamentals of harmony as they work in jazz on the harp – and develops the 3 Pillars of Jazz Harmony: Extension, Alteration & Substitution. JAZZ HARP WARMUPS – this ALL NEW progressive warmup series takes you inside the progressions and rhythms you’ll see in jazz tunes and lets build and strengthen your jazz rhythms every day throughout the summer share more secretly just within the class community). You’lll BLOW YOURSELF AWAY seeing how you can spontaneously turn each melody into a complete Blues arrangement. By the end of the summer you’ll have a set of exercises to keep your rhythm and harmony in shape, a deeper understanding of harmony and theory, a jazzier repertoire and skills and tricks to help you play with others. Purchase includes access to all online materials for 6 months plus download of all PDFs & MP3s from the class to add to your personal digital library. – PLUS 6 months access for additional self-paced training and review. NOTE: All students currently in Hip Harp Academy at the FULL Level – are ALREADY REGISTERED for SUMMER HARP JAM – PLUS all the other “Jazz for Harps” course – and will get ALL bonuses announced for this program (so if you’re already a FULL-Level member of the Academy, don’t sign up again!). If you’re not in the Academy and you want to make sure to get absolutely everything, including a full year of classes at Hip Harp Academy check out Hip Harp Academy Yearlong Membership Here or just register here. 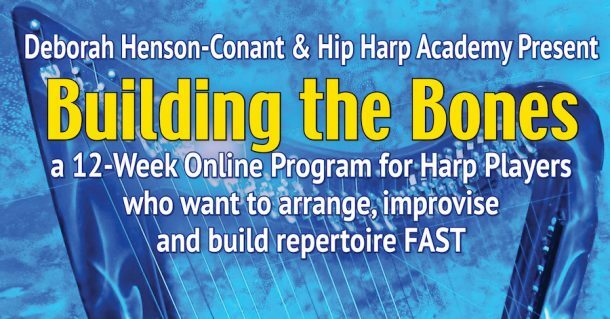 Hip Harp Academy Full Yearlong Membership includes “Blues Harp-Style” PLUS over a dozen other classes, including Hip Harp Toolkit / Arrange Yourself, Summer Harp Jam, Strings of Passion, Baroque Flamenco Beyond the Page PLUS any bonuses offered for single classes like this one. If you have questions about how it works, just email using my Ask a Question Form. Sign up for “Summer Harp Jam” only, at the 2016 single-class price! GOT QUESTIONS about SUMMER HARP JAM? If it’s so easy to just PLAY – why can’t I just sit down and do it? Why do I need “Summer Harp Jam”? Knowing WHAT to jam on is an important part of making it easy and setting up the situation so you can have fun – whether you’re playing alone or with others. If you’re playing with other, knowing how to explain the jam to them is an important part of making it work — so that’s why you get a script (yes! Literally, a short script) for explaining each jam, so you’ll be able to quickly show-and-tell others, and play it together – whether they’re harpists or other musicians. Part of the beauty of jamming is that each person has a part to play – and everyone gets to create the part they play based on their current level of ability, even if that means playing a few choice bass notes, or a chord on the downbeat. That’s one of the beauties of being an adult learner. As an adult, you can learn how to take responsibility for your own learning – how to chunk things down, and how to do them at a fundamental level until you’re fluent there — and then continue to add complexity or embellishment. And that’s one of the things I’ll show you over and over in Summer Harp Jam: how to play each jam at a fundamental level, and how to expand and embellish it to fit your technical abilities as they develop from doing the jams themselves! That means you can always choose whether to kick back and play at a fundamental level, or challenge yourself to a higher level of complexity … or switch back and forth! You want to improvise ‘like somebody else’ – there are certain teachers who can show you very specific stylistic improvisation styles – but I’m not one of them! My forte is showing you how to feel more comfortable with the art of imperfect play, which is THE essential step towards finding your own creative voice! And guess what? I use a many of the same improvisation games and skills she taught me in my work today, both as a performer and as a coach. and now I want to teach you! When I was a little girl, my mother wasn’t trying to teach me to be a musician, she was just trying to show me how music ‘works’ so that I could play with it on my own — the same way she taught me everything else. She was a Campfire Girl, so she knew a gazillion songs – and a lot of those songs were “Call and Response” songs — songs where one person sings and the other person sings the same thing. Without knowing it, I was learning a powerful tool for passing on melodic invention and rhythmic power. And I just thought I was playing games! Those same games are the foundation of this course. I’ve taken that concept to use in the training videos – so you can play along with everything I’m teaching you. And because I learned all this as a very little girl – and I still do it today – one of the things I learned is that these games are not about technical skill. Like most of the things I love, they’re things you can do at a very simple level – and then embellish and expand for the rest of your life. I realized that PLAYING – the way we do as children – is a powerful tool for learning as musicians. So I built this entire program on the idea of playing with very simple ideas – the kinds you could explain or show in a few minutes – and getting more and more comfortable with them until they start to bloom in your hands. Here’s what you get in Summer Harp Jam! Weekly PLAY-BACK-TO-ME VIDEOS where I’ll set up the jam groove, then I’ll play on camera and leave space for you to play back to me. This is one of the most fun ways you can learn to become fluent with melodic improvising – and you can watch over and over, playing what I play at first and then responding with your own ‘answer’ to my musical line. PLAYALONG MP3’s for every jam in 3 different tempos (slow / med / fast) so you can kickback and play along, putting into play everything you learned in the Play-Back-to-Me videos – or just making up your own melodic lines! You’ll get to download all the MP3s and PDF materials and keep them on your computer and you can come back to the classroom for up to 3 months after the class is over to review the videos, add comments and keep on interacting with your classmates. Have the courage to say “Let’s Jam!” to another musician — and then be able to describe exactly how the jam works so that you can play together. Use your music stand for drying your underwear … since you won’t need it to hold your sheet music! I debuted “Summer Harp Jam” last summer – and it was so jam-packed with fun ideas and play-alongs that I’ve expanded it this year. – Once a Week I’ll hold the live online Play-along and Chat (it’s usually on Sunday afternoon EDT – except when I’m touring). Usually about a third of the students attend the session live and the rest watch later via replay. – In the classroom you’ll be able to download “Naked Play-along Tracks” – MP3 files you can put on your computer, ipod or ipad. Each is about 5 minutes long and they’ll give you the underlying rhythm and harmony of the sequence so you can just kick back and experiment improvising using the ideas I’ve shown you in the Play-Along session – or making up your own. – You’ll get 2-3 new jams during each class, usually all based on the same underlying progression – so you learn one pattern and then you do lots and lots and LOTS of different things with it! There’s always at least one rubato version for playing in meditative or bedside situations and one with a cool rhythm. – The weekly jam sessions are 90 minutes long. We start with 60 minutes of playalong where I show you each jam and then play it, showing you variations and melodic ideas as you play back to me. The last 30 minutes is set aside for questions. – Between sessions you can review the play-along video as many times as you want and download the “Naked Play-along Tracks” (they’re kind of like Karaoke tracks!) to play them over and over as you practice and explore the ideas you learned. – You get warmups and prep pages for each week if you’re the kind of person who likes to prepare. 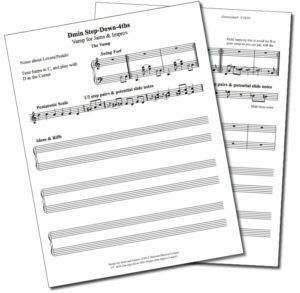 Plus you’ll get all the extra rhythms and variations all outlined in a go-at-your-own-pace activity roster. So if you want to prepare for the weekly jams – you can do that – because a new module opens each week filled with activities and little ‘jam-lets’ you can play along with. In fact, there’s waaaaay more in the Summer Jam camphouse than you can possibly do in one summer – but that’s no problem, because you get access to the virtual camp for at least 6 months if you want to go back to it! Summer Harp Jam is for just kicking back and PLAYING ALONG in all the jams. No homework, no pressure — it’s A VIRTUAL SUMMER CAMP FOR HARP PLAYERS! And YES, you can always play at YOUR level – whatever that is – because I’ll always show you ways to simplify (for fledgling players) and embellish (for advanced players) so you can just have FUN. Got Questions? Use the “Ask a Question” form and I’ll get back to you ASAP. THIS IS WHAT EVERYONE’S BEEN ASKING ME FOR! Everyone has been asking me to help them learn to just sit down and PLAY, and every time I create playalong videos everyone loves it! So I decided to build a whole 6-week course that’s ALL playalong – so that by the end you’ll be able to just sit down and jam – whether you’re playing in a wild rhythm jam, or a quiet responsive jam sequence at a bedside. THIS PROGRAM IS THE MISSING LINK! I’ve been searching for a way to teach rhythm and melodic improv, and to give people a way to practice it over and over – because, while rhythm and improv are both a part of all my online courses, I don’t have a course that focuses JUST on those elements. When I had the brainstorm of building “Summer Harp Jam” I realized it’s the perfect way to learn both melodic improv AND rhythms at the same time!! Only instead of ‘learning,’ you’ll just jump in and play along with them, having fun from the beginning and getting more and more comfortable the more you do it … by PLAYING! IT SOOOOO MUCH FUN! Did I mention It’s really, really FUN — because you get to play ALONG with videos and audio files, so the program materials are like having an imaginary friend to play with! And when you share the jams with others, that imaginary friend becomes a real one! “SUMMER HARP JAM” MAKES YOU STRONGER: Like any good summer camp, the games, sport and environment make you stronger and healthier. And it’s the same with SHJ: it strengthens your hands, your coordination, your ear, and it also strengthens you as a LEADER with other musicians because YOU’LL be able to say “Let’s Jam ” and actually describe what you’ll all be jamming on! AND NOW – IN SUMMER 2018 — it’s “Summer Harp Jam PLUS” — and includes ALL FOUR PROGRAMS that make up the new “Jazz for Harps” program: “Summer Harp Jam”, “Inside Jazz Tunes”, “Hands on Harmony” and “Jazz Harp Warmups” for FULL-SPECTRUM FUN that expands YOUR creative expression! YOU GET RHYTHM!! By the end of the course, you’ll be playing Latin rhythms, swing rhythms, at least one odd-meter rhythm (like 5/4 – the rhythm of “Take Five”) – and you’ll be improvising in all those rhythms even if you have no idea how to ‘read’ them on the page. How? You’ll be playing along with the jam-tracks – so you don’t have to get it perfect the first time! You just jump in the water of the playalong track and flail around the first time, and the more you do it, the more comfortable you get. And in the weekly Q&A sessions you can ask for specific help if you’re still having trouble with them. YOU CONNECT TO NEW FRIENDS AROUND THE WORLD! This may sound crazy, but when I was in Paraguay in 2014 I saw a concert with about 50 harps. The audience loved the concert and when the master harpist ended the concert, the audience demanded more. It was clear the group hadn’t prepared for more music, but the master sat down and played a short melody. 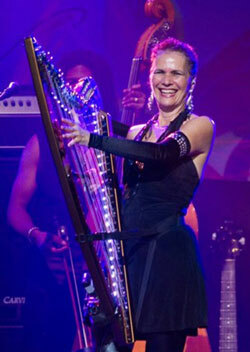 Then he turned to the 50 harps and they were all smiling and nodding. He started playing again and every one of the 50 harps joined in — and I realized that this was a tune they all knew, they’d all learned and they all could play it together – it was like a GAME that everyone knew the rules to, so as soon as someone ‘called the game’ everyone could just start playing. When I created “Summer Harp Jam” I kept imagining a moment where several harp players meet by accident with their harps – on the street or at a harp festival, and because they know the same jams they can just sit down and start playing together — really PLAYING — without music, without agenda — like a wonderful game. That made me so excited about the course! I just kept seeing this possibility for a ‘lingua franca’ that made it possible for people to spontaneously play together! YOU CAN USE THESE JAMS IN RESPONSIVE-PLAYING SITUATIONS – One of the things you’ll learn is how to style music differently. This is actually really easy, and really fun – for example, it’s easy to turn the Pacelbel Canon into a Samba (!) by ‘styling’ it with a Latin rhythm. By the same token, you’ll be able to take any of the jam sequences you learn and re-style them for more meditative or responsive playing – and yes, I’ll show you how! I’M YOUR JAMMIN’ CAMP COUNSELOR! You could take all the jam files you’ll get and just work on them on your own, and you’d be getting sooooo much by doing that – but each week I’ll be PLAYING them live in online sessions where you get to play back to me what I play – so you learn by doing – and they’re live so the people who attend live can ask questions and help me adjust what I’m doing to work for the students – so whether you attend live or watch via replay, you’ll get the benefit of that live interaction. also have time for. You’ll be able to send in your own questions even if you can’t make those live sessions so you’ll get the answers you need to help clarify anything YOU need clarified and have even more fun playing these musical games. Q: WHAT SOFTWARE DO I NEED FOR THE COURSE? A. You don’t need any special software or hardware. You can take the course on your computer or ipad. You’ll watch the course videos on line, and you can download the MP3 play-along files and PDFs. Even people who consider themselves completely non-tech-savvy are able to access and enjoy the course. Some people even say that one of the big benefits of the course is getting more comfortable with online tech formats! Each week the course information is provided in three formats and there’s always a “low-tech version” so you’ll able to access the basic course materials without interactive software (like a live-stream webinar) because I’ll be videotaping each lesson and providing PDF outlines for you to follow. A Live Q&A Session – at the end of the play-along webinar, I’ll answer any questions you have – and if you’re not attending live you can submit your questions in advance and watch the answers later in the video replay. So even if your tech-savvy only goes so far as knowing how to link to a webpage, watch YouTube and download a file, you’ll be able to get all the class information. The truth is, there’s always a bit of a learning curve unless you’ve taken online courses before — and online chats and masterclasses will never be as high-fidelity as being there live — but many people have actually told me that my online courses have given them the added benefit of learning to navigate the web in new and empowering ways — and that makes me very happy! Q. WILL I HAVE TO DO HOMEWORK? A. TaDa! No homework in this program! This program is all about PLAYING ALONG so I’ll encourage you to play with the course audio on your own … or with your friends … as much as you can. And there will be jams that you can do with friends who aren’t even musicians — like a jam to play with someone playing Pots-and-Pans in the kitchen! Q. HOW MUCH TIME WILL I SPEND ON THE PROGRAM EACH WEEK? A. That’s pretty much up to you. You could just spend an hour a week if you just want to watch the play-along video and play along with it. OR, if you want to ‘get the most bang for their buck’ you can spend as much as an hour or more a day, watching the videos, downloading the materials and then putting it all into practice and playing with others! Most people fall between those two extremes – and it’s totally fine how YOU want to use the program and how it fits into YOUR life right now. That’s also why you get access to the website for at least 3 months after the program ends – so you can go back and review. The most important thing you can do each week is to find one simple idea and put it directly into your playing at your level. If you do that ONE thing each week you’ll get more out of the program than reading and watching everything but not putting it into practice. So if you don’t have much time one week, you can skim the play-along video, find your ‘nugget’ for the week, put it into practice and feel great that you’re getting something that will change your playing for the rest of your life! On a practical level, it would probably take you about 2 hours a week to just go through the play-long video and download the audio files and PDFs so you have them for future use. And you don’t have to do it all at once! I’ll break each week into 2-3 different jams and you can work on them one at a time. One very cool thing about this course website is that you can ‘check off’ each activity as you do it (an ‘activity’ is a video or a page, or a discussion) so that when you go back, you can see exactly where you left off. So it should be easy to log in once a day for 10-15 minutes and go through one or two ‘activities’ each time. You won’t ‘get it all the first time’ – and that’s not important! These jams are like games that you’ll be able to play for the rest of your life. What’s important to me for “Summer Harp Jam 2016” is that you find at least a few that you really love, and you have FUN playing them! A. That concept doesn’t really exist for this program. Each week you’ll be learning different jams, so if you miss a week, you can just jump back in – and you get two BONUS REVIEW WEEKS at the end so we can go back over everything and you can ask questions. And remember: people will take different things from the program. Sometimes I get one ‘elegant idea’ from an online program that gives me all the knowledge and power I need to shift to the next creative level – and that’s what’s really important. Sometimes I need to practice an hour a day and really engage online in order to feel I’ve gotten what I need from the course. I wanted to structure this program so that regardless of how you like to learn and play, you’ll be able to get what you need from it. Q. DO YOU PROVIDE MUSIC TO GO WITH THE COURSE, OR DO I NEED TO PROVIDE MY OWN? You’ll get all the music you need from within the course. Each week you’ll download the jam sequences – and that’s all you need! You actually don’t even need that, because I’ll also show you the jam sequence on a video! Q. HOW DOES IT WORK WITH THE DIFFERENT PLAYING LEVELS ALL IN ONE COURSE? All my online programs (and even my offline programs!) are multi-level and for both lever and pedal harp and it works because I always start by teaching the underlying concept of what we’re doing. Each concept can be expressed in infinite ways, at infinite levels of ability – and part of the fun of each course is your collaboration with me in finding the ways to play them that you can play right now. There is no limit to how much you can simplify or expand a musical concept. For each thing I show you, I’ll always include a distilled/fundamental/simple version of it and ways to embellish and expand it. And if it’s either not simple enough … or not complex enough for you, then you can ask for a simplification or an embellishment — and that’s part of what I’ll do in the live Q&A sessions and part of what creates such a vibrant sense of involvement and ‘live-ness’ in the class. Summer Harp Jam is different than many of my others because this is SO focused on playing in the moment, and the live sessions will include a lot of time where I’m playing and you’re playing back to me BUT that doesn’t mean you need to play exactly what I’m playing each time! If you’re still a fledgling playing, you may only play the first note of what I play until you get comfortable to add more notes — and that’s why you’ll get to watch and play-along over and over. If you’re an advanced player, you may want to embellish the line I play when you play it back to me! And one of the incredible advantages of virtual ‘live’ events (like the play-along sessions) is that you won’t be disturbed by the playing of others and you won’t be comparing yourself to the playing of the others — everyone will be playing along ‘together’ … at completely different places on the planet! Q: CAN I GET A TASTE-TEST?? I’VE NEVER BEEN IN AN ONLINE COURSE - Is there a way to just see how it works? YES! I created a special little course that you can take for free. It’s called “HaRpy Birthday” and it’ll give you a taste of my teaching style. 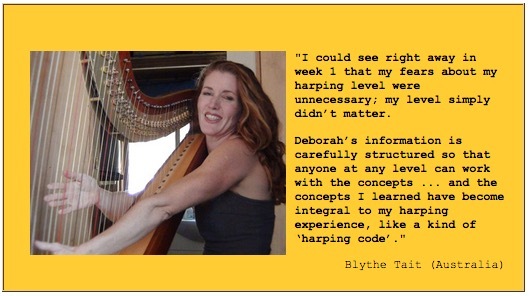 Just sign up for “DHC Freebies.” That gets you a “Free Level” account at Hip Harp Academy. Then just look for the “HaRpy Birthday” icon and you can take that mini-class to see what it’s like to work with me online. Q: WHAT TIME IS THE CLASS? Will I have to get up in the middle of the night! No worries – you can take the whole Summer Harp Jam, at your own pace. Everything is recorded and many people prefer to never come to the live parts and just watch via replay or download the MP3s and just listen and play along. The ‘live jams’ are recorded and I try to get them online within 24 hours. If people want to dig in and spend more time, there’s a plenty of additional warm-up material that opens weekly. > MONDAYS: The Live Jam Replay is available along with downloadable PDF “play-sheet” and the MP3. Usually about 30% of the students come to the weekly live jams. The rest prefer the replay, so they can do it on their own time. Q: WILL THE STYLE YOU’RE TEACHING BE MORE ‘JAZZY’ RATHER THAN FOLKY OR HYMN-LIKE? WHAT A GREAT QUESTION! Summer Harp Jam explores a lot of different styles, and one of them is always ‘rubato’ or ‘straight’ – as opposed to rhythmic. We take one basic progression each week and learn all the things you can do with it: how to use it for intros, endings, interludes, improvs, meditation, bedside playing, how to break it apart to play with others. And yes – you can ABSOLUTELY jam with Hymns and folk songs – and you’d learn a lot about how to do that in Summer Harp Jam. It would be fairly easy to expand what you learn to Hymns or the progressions in folk songs – and what’s SO GREAT about taking this program LIVE is that, if you have a special kind of music you want to explore – you can ask me how to do that in the Jam-Chats. What I’ve done in Summer Harp Jam is to choose progressions that are so short that people can literally learn them in 30 seconds, so that everyone can focus on how to have FUN with them instead of worrying about how to read or remember them. And I’ve chosen some of the most useful progressions I know, chord sequences that show up over and over again in lots of pieces. So you won’t be learning ‘songs’ per se in Harp Jam – you’ll learn progressions you can use with songs. If you want to take a look at a little warmup version of “Summer Harp Jam” to get a sense of how it works, here’s an online “Webinar” training from last year that you can watch. Let me know what you think! Q: IS THE MATERIAL IN SUMMER HARP JAM UNIQUE TO THIS COURSE? If I’ve taken your other courses is this NEW material? This course is unlike any of my other courses. I tried to make it more like a summer camp – with activities, LOTS of play, and no homework! If you’ve been in my courses you’ve probably experienced at least a little bit of “call and response” where I set up a background accompaniment on my looper and then I play little melodies and you play them back to me. Every time I do that people LOVE it and ask for more – so Summer Harp Jam is based entirely on “Call and Response” – on JAMMING together – because it’s such a fun and effective and freeing way to learn to improvise and to simply have FUN playing your instrument. Each week you learn a new sequence – which takes about 30 seconds. Then you learn a whole bunch of things you can do with it – from creating intros, endings and interludes with it – to creating full improvs. You learn different bass patterns you can use with it, scales you can use with it, and various ways of creating rhythms with it like Waltz and Latin rhythms – as well as how to use it in responsive and contemplative settings like hospice or meditation. The course is not sequential. If you miss a week, you can just jump into the next week and it’s not a big deal. That’s because the activities are all based on a set of chord sequences – a different progression each week. And you can learn as little or as much of that as you want – because the JAM part of the program is the real heart of it: each week we have an online JAM where I set up the progression with my looper, and then we play! I play a riff and you play it back to me, I play a riff and you play it back. It’s basically the way I learned to play as a kid: call & response. It’s incredibly fun and you don’t need to play exactly what I play because nobody can hear each other and it’s not about ‘getting better at copying’ – it’s about getting comfortable improvising and learning the kinds of musical gestures and scales work for you and are most fun. Q: MY INTERNET ISN’T GREAT. HOW MUCH SUMMER CAMP IS VIDEO AND HOW MUCH IS LIVE STREAMING? The “static” part of the program – the part that’s already there when you get into the classroom – is embedded videos (plus PDF handouts, text and downloadable audio). The video content includes both “warmup” or “prep” videos PLUS last-year’s live-stream jams chunked into segments that are based on content. What that means is that I took the original jams I created live, and then edited them ‘bite-sized’ chunks. I also created extra videos last year when people had specific questions. All of that is available as soon as I open each module. Most of those are 5-10 minutes long. The longest seems to be about 15 minutes. For every video on the page, there’s also a downloadable mp3 at the bottom of the page. That means you can get the mp3 right onto your computer and then avoiding worrying about internet at all. I try to be careful when I ‘show’ things on the video to also name the notes, since even when people can see the video, it’s not always close or clear enough to be useful. Also, the focus of this particular program is “call-and-response” where I play something and you play it back, so most people find it most useful to just put the audio on, and play along based on the prompts I give. This program is unique in that way (although I’m starting to use that technique more in other courses because people love it so much – and it’s fun for me as well). The LIVE weekly jams are all live-streamed. Usually only about 25-30% of the people actually come live. The rest prefer to wait until we post the replay, and either watch that online or just download the MP3 and play with that. I’m not sure if they do that because of their internet connection or just because they prefer to be able to stop and start the jam at their own pace. Q: WHAT IF MY INTERNET IS OUT? We can’t always count on internet, as great as it is. That’s why I record everything we do in the program and then add it to the classroom so people can watch at their own pace, or download the MP3s and the PDF play-sheets to have on their own computer or MP3 device. 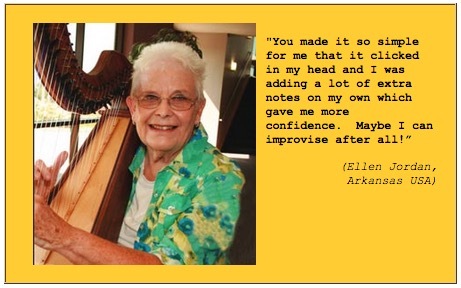 Q: WILL I LEARN TO IMPROVISE IN “SUMMER HARP JAM”? Yes! Summer Harp Jam is all about learning to improvise by playing along with me! To make that easy and fun, the whole program is based on small chord sequences. These are sequences you’ll find in lots and lots of music once you know how to look for them. You’ll learn to use them for solo harp or to jam with others — and how to use them to create on-the-spot intros, interludes, endings and improvisations. You learn to do it in rhythmic styles or rubato — lots of people end up using these little sequences for contemplative or therapeutic improvisation. A. YES! Depending on when you sign up there’s a payment plan that lets you split the payment (if you sign up outside of the normal registration period, the payment plan may not be available). To see whether or not there’s a payment plan and what it is, click the ordering link as if you’re going to order and you’ll see the payment plan outlined on the order form.